Get the horn (and make it go as fast as you like) with L'otary. PSP Audioware's latest vintage emulation is a digital mockup of a classic Leslie rotary speaker, giving users a huge amount of control over the sound compared to the hardware. The original Leslie rotary speakers hoisted a spinning horn tweeter and a downward-facing woofer inside a wooden drum that was rotating the other way. The effect was a cool amplitude modulation that was often paired up with a Hammond organ, especially in the 60s, to legendary effect. 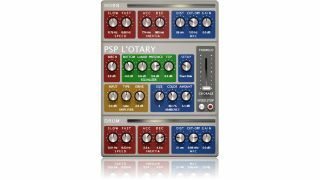 PSP's version offers separate controls for Horn and Drum movement (Slow/Fast, Inertia, Distance, Cut-off and Gain), as well as tweakables such as Amp Input, Type and Drive, 'Ambience', Basic EQing and more. It's modelled on Leslie models 122 and 147. The plugin is available on an introductory offer if $69, and comes in AU/VST/RTAS/AAX forms. In February, the price will ride to $99. Get more info on the PSP Audioware website.